The Metro Board of Directors on Thursday unanimously approved a new light rail station at Aviation Boulevard and 96th Street along the Crenshaw/LAX Line to serve as the “gateway” transfer point to an Automated People Mover that would take people to terminals at Los Angeles International Airport. The people mover is being planned by Los Angeles World Airports (LAWA), which would also build the project. The next steps: Metro must environmentally clear the station, design it and identify the funding before anything gets built. The Crenshaw/LAX Line is currently under construction and the new station will be built as a separate project. The Crenshaw/LAX Line is scheduled to open in 2019; the people mover could be completed as early as 2022 according to the Metro staff report. Officials with L.A. Mayor Eric Garcetti’s office said Thursday that the city will attempt to accelerate that date. The Metro Green Line infamously came up two miles short of LAX and requires a shuttle bus ride to reach airport terminals. The new Aviation/96th station would also serve some Green Line trains; please see the conceptual operating map below. People movers are a type of train and are used to connect to regional transit systems by large airports in the U.S. and abroad. The chief advantage of the people mover over the existing shuttle bus: the people mover would run on an elevated guideway above traffic while the shuttle bus shares roads with traffic. The new Aviation/96th station would be about .4 miles north of the station to be built at Aviation and Century boulevards as part of the Crenshaw/LAX Line. The idea, according to Metro, is that the Aviation/96th station would be the gateway for passengers headed to LAX while the Aviation/Century station would connect riders to the many businesses along the Century Boulevard corridor. Metro Board Members made it clear that the Aviation/96th station needs to be extraordinarily designed to serve as the airport gateway. 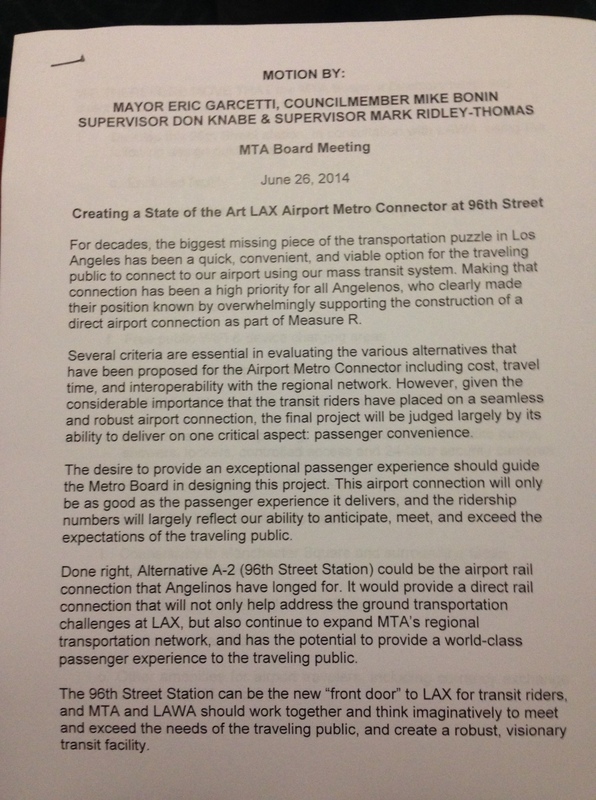 “The question before us is can 96th Street do what it needs to do to be a world class experience?,” asked Board Member Mike Bonin who co-authored a motion (posted after the jump) directing Metro to make the station an enclosed facility with a number of amenities including concourse areas, restrooms, LAX airline check-in and public art, among others. The motion was co-authored by Garcetti and Supervisors Don Knabe and Mark Ridley-Thomas. LAWA is scheduled to finalize details on the people mover alignment and the number of stations near airport terminals in Dec. 2014. In a presentation to the LAWA Board in May, LAWA staff showed options that included two or four stations for the people mover within the central terminal horseshoe. Should LAWA move the people mover alignment back to 98th Street — as was previously studied — Metro would seek to make the Aviation/Century station as the primary connection point to the people mover. Metro — in coordination with LAWA — has in the past couple of years looked at a number of options for connecting the airport terminals to the Metro Rail system. Among those was bringing light rail directly to the terminals or building a spur to a new airport transportation hub that is being planned east of LAX. Ultimately, Metro studies found that a Metro Rail-people mover connection took about the same time and resulted in about the same ridership as having a light rail line run directly into the airport terminals. The Metro Rail-people mover connection also cost billions of dollars less and resulted in speedier train rides for Crenshaw/LAX Line passengers not heading to the airport. In the future, it’s expected that about 57 percent of airport bound passengers would arrive by private car, 33 percent by shuttles, taxis and limos, eight percent by the Flyaway bus and one to two percent via transit buses and trains, according to the Metro staff report. About 66.6 million passengers used LAX in 2013, meaning even small percentages can add up to a lot of riders. Metro Board Member Don Knabe raised a salient point several times in recent months: what guarantees are in place that LAWA will actually build the people mover? LAWA Executive Director Gina Marie Lindsey told the Metro Board on Thursday that traffic has gotten so bad in the airport’s horseshoe — up to 200,000 vehicles a day — that the airport must build the people mover, a consolidated rental car facility and a new ground transportation hub to steer more vehicles away from the terminals. The Airport Metro Connector is one of the dozen transit projects to receive funding from the Measure R half-cent sales tax increase approved by 68 percent of Los Angeles County voters in 2008. Please see the motion on the Aviation/96th Street station that is posted after the jump. I suppose this means the goose is now cooked. We should all give up our hopes of LAX getting a world-class people mover system, since Los Angeles World Airports does not believe we are worthy of a secure people mover loop connecting all 8 terminals. There’s still hope to salvage this ridiculous plan, however. We should all get together and lobby Mayor Garcetti and the board of LAWA to reconsider a terminal loop, with a secure check-in facility at the ITF. I have been exploring future Metrorail connections between LAUPT/Downtown LA and LAX. Airport-bound passengers would have to take the Red Line, Expo Line, Crenshaw Line, and some sort of shuttle to the airport. That’s a 4-seat ride and that is ridiculous! I don’t mind the people mover not being a loop at all. LAX terminals are so close together that’s it’s not that a long walk to terminals anyway. The only stupid part of this plan is that now there’s two stations that’s less than 0.3 miles apart (Aviation/Century and Aviation/96th) which would’ve been better if it was just one giant station instead. One station with a long platform would’ve been better to allow for longer trains that’s going to be needed in the future as LA plans to bid for the 2024 Olympics. Well by the time the people mover opens the Regional connector will be open so Expo to Crenshaw to People Mover. Or take Blue to Green to People Mover. For instance in Singapore you have do the same thing, transfer to the airport line and then get on the people mover to your terminal. Not everyone is coming from DTLA to LAX anyways and hopefully we can get the Crenshaw line up to WeHo that will make it much better. Or from Union Station they COULD just take the FlyAway or $7, 0 transfers…. It’s now $8 one-way between Union Station and LAX. Alternatively, the people who complain about “X seat rides to get to LAX or where ever” do also have the option to move from the suburbs back to the city closer to where all the public transit options are. That’s another way to reduce the number of transfers needed. Hate 4 seat transfers from DTLA to LAX or vice-versa? Then move to a condo in Mid-Wilshire or Koreatown. Why would anyone be crazy to live so far away in these crazy gas prices is beyond my understanding. Living in the suburbs and commuting 30 miles made sense when gas was cheap and there weren’t so many cars on the freeways. With gas prices these days and the horrendous traffic jams, it’s stupid to be living so far away from work. There’s one big reason for living out in the suburbs and that is (or are) the schools. LAUSD has a horrific dropout rate and is poorly managed, Los Angeles is still park poor, and competitive private schools are extremely expensive. Many people who grew up in the suburbs have family and friends there which make it easier to arrange free day care, and there are also more outdoor activities for the kids to do there. Sometimes that is worth the hour drive. To WestLAer: I live in pricey DuPont Circle in the heart of Washington DC with great public transit and convenient to everything. I am a 3 minute walk and 9 minute Metro ride to Union Station where I report to work. Gentrification is killing affordable housing in the city so policemen, firemen, teachers, and retired train conductors like me can no longer afford to live in DC. It’s the same situation in LA. The suburbs are CHEAPER. The distance quoted in the article is incorrect. My map says it’s no more than 0.25 miles between 96th and Aviation/Century. Interestingly, that’s the same distance that was called “too close” on the Regional Connector project, leaving the densest block in the county (5th/Flower) without a station. @West LAer Mid-Wilshire or Koreatown would be a 4 seat ride (Purple-Expo-Crenshaw-Peoplemover). It would only be two seats from suburban Norwalk or the South Bay (Green-Peoplemover). It’s also a one seat ride via Fly-Away from Van Nuys. Maybe living in the suburbs is better after all. BTW…The Westside is a suburb too. It’s just as far from Downtown as Whittier. You still have to get to the Flyaway bus stop or the closest Metrolink station to get there. So you need to factor that hassle in. How will you get to the Flyaway bus stop or the closest Metrolink station with bags from your suburban home to make the trek to LAX to begin with? You’re better off hiring a taxi if you’re living in the suburbs. In contrast, living in Mid-Wilshire/Koreatown, the bus stop and rail stations are right there within walking distance. Plus, you even don’t need to take the train from Mid-Wilshire/Koreatown to LAX. You can take the 710 to Crenshaw and transfer to the 102 to the LAX Transit Center. The people mover should stop at every other terminal since they are very close to each other. The stops should be at terminal #1 #3 (TBIT in between) #4 and #6 or terminal #2 TBIT #5 and #7. This would be perfect if it were looped instead of the spine or scissor style proposed earlier. The suburbs are boring. There’s nothing interesting to do. The city is more interesting. There’s always new and different things happening all around. If affordable housing existed in the city, I’d ditch the monotonous and fake life in the suburbs and go live in the city. LA needs to wake up from the suburban mindset of the previous generations. People these days have absolutely no interest in living a suburban life today. Not in these gas prices, not in these traffic jams. Get rid of outdated zoning laws like height restrictions and parking lot requirements, build more high rise condos, increase the housing supply and lower the prices. That’s what LA needs to do. I really don’t see the fascination that others have with having the people mover making stops in a loop fashion at every single terminal as people are crying about. London Heathrow has similar conjoined stations stops like LAX’s plan. The London Underground’s Picacdilly Line has one station for Terminals 1,2, and 3 (yes, that’s one station for all three terminals), one for Terminal 4, and one for Terminal 5. And London Heathrow runs perfectly fine that way serving more passengers than LAX. The terminal arrangement of LAX is small enough that two people mover stations will suffice to handle all passenger traffic to 8 terminals. If you guys are too lazy to walk to not even go from a conjoined station to your terminal, then I suggest another way to get to LAX which drops you off right in front of the terminal. You can use the Flyaway. You can ask a friend to drop you off. You can use a taxi cab, a hired limo, or a Super Shuttle van. It’s not like these options are going to go away. London Heathrow also has the fantastic Heathrow Express to Paddington station. Explain to me the rationale of building two stations that’s less 1/3rd of a mile (less than 1500 feet!) according to Google Maps? So what, if I want to go from Aviation/96th station to Aviation/Century station where the two stations between each other are less than 1500 feet away, I pay $1.75 for the privilege to take the Green Line for a 1500 ft trip? 2) Why there’s a need for a new station instead of using the existing Aviation/Century station. “The idea, according to Metro, is that the Aviation/96th station would be the gateway for passengers headed to LAX while the Aviation/Century station would connect riders to the many businesses along the Century Boulevard corridor.” Why couldn’t Aviation/Century do both? The Century Blvd station is now redundant. Why is it needed if the 96th Street station has the people mover connection? The Century Blvd bus 117 route west of Aviation will be also be redundant when the people mover is completed. Time to scrap the former station and save some money!! How will Green line trains turn around at this station? Will this be a three track station, like the plans have indicated that Avation/Century will be? And will there provisions made in the design to facilitate the addition of lines up Sepulveda and Lincolin when they hopefully get built in the future (Which could very well terminate at this station)? Please, one comment — maybe two — per reader. Thank you! They need to consolidate the Century Blvd, 96th St, and ITF stations into one large Union Station West that connects all all trains, buses, and passenger drop off. With this design all they are doing is making it more decentralized and less efficient. Why don’t they explain WHY they need to have 3 stations. The Century Corridor currently has zero bus ridership and does not need a station – show us some quantitative evidence. The ITF is totally pointless. Please explain WHY that is actually needed, if there are already 3 nearby stations (96th, Century, ConRAC). If metro agrees to the operational pattern shown. They might as well run trains all the to expo/Crenshaw station at least on temporary basis until some kind of extention is played for the green line east which may put the west santana ana branch in play further down the road. Just throwing some ideas out there. 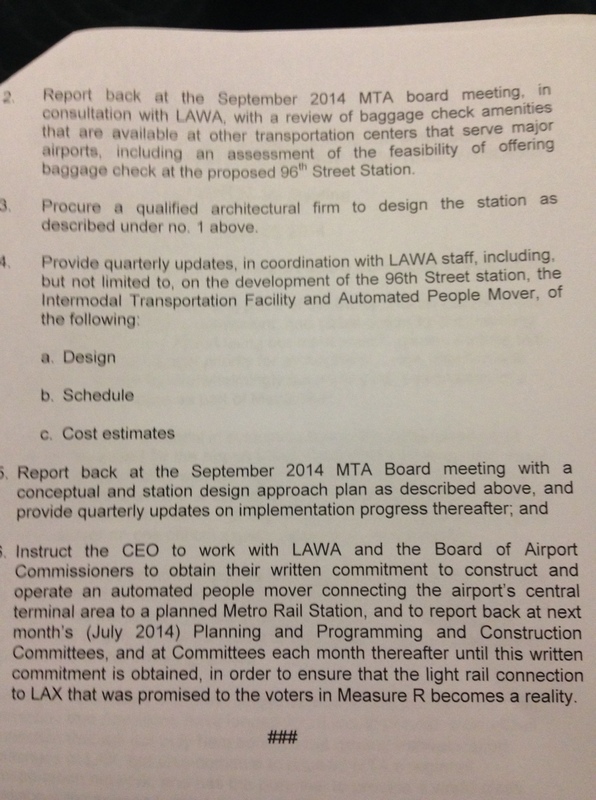 Since Metro has been forced to accede to LAWA, these plans made by Metro seem good. Of course it doesn’t surprise me that very few people that are commenting have actually read the most recent report by LAWA. If you had, you would realize that the plan by Metro is probably the best it can be. They really have it wrong this time. There has to be a fast easy connection between the people mover and the LRT lines. (South Bay, Crenshaw, Green Line and the Heavy Rail Line from Sylmar, Van Nuys and west LA) There is no room for this connection at Century. Also who will be using the Century station? Most LAX riders will use the people mover at the 96th St Station. All of the local buses can end at the 96th St station. The people mover also needs to stop at every terminal to avoid long walks with people with luggage. It can be a single track loop around the terminal with a loop at the car rental terminal end also. Otherwise passengers will continue to drive, use the Supper Shuttle or a Taxi. If it is not convenient it will not be used. Ideally the transfer at 96th St will be a cross platform with the people mover at the same level and between the LRT tracks. A 8 foot walk across the platform sure beats an escalator, stares or an elevator. To answer a question about why both the Aviation/Century & the proposed station at Aviation/96th St are both useful: from many maps I’ve seen, some of the major hotels around LAX are along Century Blvd between Aviation & Sepulveda boulevards. Even if visitors don’t use the proposed people-mover & decide to stay near the airport, a rail station would be nearby. While I personally am not crazy about LAWA choosing not to utilize the Aviation/Century stop as part of its people-mover & forcing Metro to add another station (and thereby added costs to the Crenshaw/LAX Line), at least it appears that both Metro & LAWA are moving forward on a real rail plan to LAX. Steve, your “one comment” rule (or 2 comments now since I guess you’re feeling “generous”) makes no sense whatsoever. The point of the comments is to have an informed DISCUSSION on the matter. What’s the point if people cannot communicate with EACH OTHER on the relevant issues? Stop acting like this site receives hundreds of comments on each post (or even in an entire day). The average number of comments is well below 20 – there’s plenty of ROOM for discussion and back and forth. What are you so afraid of? That the number of comments will overload Metro’s antiquated IT system? I too do not understand why people are so vigilant about wanting front door access to every terminal and that the people mover should be a loop. The plan is fine the way it is. It has two stations right through the middle which allows for efficient terminal access on from both sides. 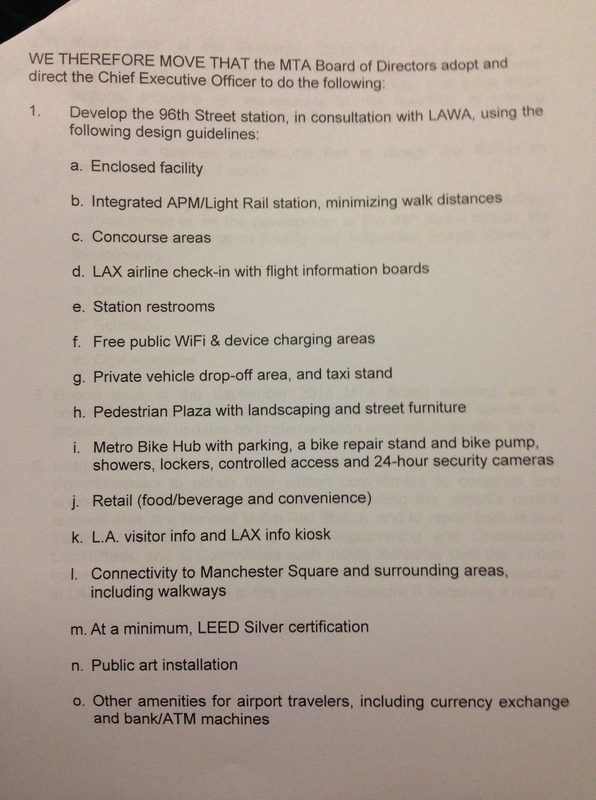 “LAX 1” station can easily serve Terminals 1, 2, 6, 7 and 8. Anyone who has frequently use LAX and understands it’s configuration can see the benefit of having a people mover right through the middle. There are many stations around the world that have this configuration. New York JFK for example, had Terminal 3 and 6 which were shared with Terminal 2 and Terminal 5 AirTrain stations. Singapore Chiangi Airport station is right at the basement of Terminals 2 and 3. London Heathrow’s Piccadilly Line has one station for Terminal 1, 2, and 3. It’s cheaper and it does the same job faster than trudging along making stops at each station. Just look at how all those shuttle buses are slow as they do that loop today. If you’re so desperate that you want front door access because you’re too lazy to walk a few feet, then stick to the car and deal with the third world traffic jams on World Way. I on the other hand, will be cruising along walking from the people mover station to the terminal and already be Admiral’s Club lounge at the American Airlines terminal 4, while you’ll still be stuck inside the car along with the rest of the cars, buses, and shuttle van traffic in somewhere around Terminal 1. And according to your “fuzzylogic,” then I can’t believe some suburban elitist who owns a McMansion out in the suburbs, owns a car (probably several along with gas-guzzling SUVs), have 20 mile commutes to DTLA for a cozy six-figure income in an air-conditioned office job in DTLA trying to set public transit standards centric to your selfish suburb-to-city lifestyle. You want to complain about about how it’s going to be 4 seats to LAX because you live in the suburbs and want to continue the suburb-to-city lifestyle? Then move to Inglewood or Hawthorne or in any of the communities near the future Crenshaw Line. Now you have an one-two seat ride to LAX. Of course, you’ll never want to because would you suburban elitists don’t want to mingle with the people that live in the working class communities there, right? The Washington DC Metrorail was designed to get suburbanites in and out of the city. It does little to accommodate inner city travel. That is left to slow unreliable busses. Obviously, the best solution would have been a direct connection to the People Mover from Aviation/Century, but that clearly isn’t to LAWA’s liking so Metro must bow to their insanity. I feel sorry for the Metro planners that have to put up with this madness. Heathrow Express opened in 1998, well after the Piccadilly Line was going there. The Piccadilly Line is one of the oldest subways in the world with its opening in 1906. LA, on the other hand, is just getting started with linking LAX with the city. We’re still babies and novices compared to the rest of the world when it comes to mass transit. If it were me and I had all the money and power to override every bureaucratic redtape and asinine regulations, I’d create a grand Union Station West right at LAX with Metro, Metrorail and the future CA high speed rail to serve LAX. But thanks to decades of poor city planning, that’s not going to happen in my lifetime. And we also have to work with democracy which involves zoning laws, environmental studies, lawsuits, etc. etc. We do not have the “China advantage” of going from blueprint to startup in 4 years. The best I can see in my lifetime is the Crenshaw Line to LAX which is a lot better than what we have today. Can’t have everything, so you got to work with what we have today. To LAX Frequent Flyer: Miami, Florida was late to embrace mass transit, but a Union Station – like the one you mentioned – is going up next to Miami International Airport. And like LA Metro Rail isn’t? The Orange/Red Lines links San Fernando Valley with LA, Gold Line links San Gabriel Valley with LA, Blue Line links Long Beach to DTLA, and the Expo Line links the Westside with LA. 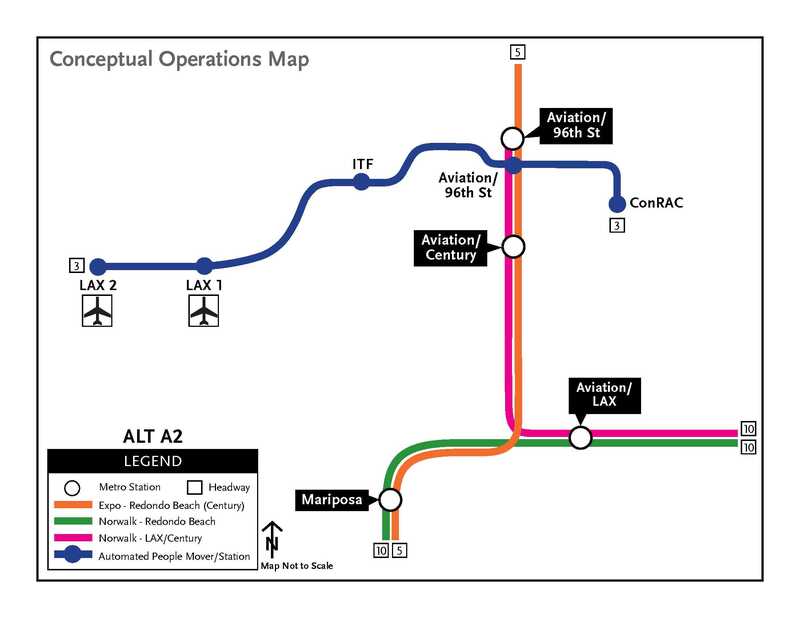 With the Regional Connector being built, Metro at the most longest length, will travel over 40 miles from Santa Monica to Monrovia. It will actually be from monrovia to long beach, and from east los angeles to santa monica. To Blue Line Rider: My point is to show how racist and elitist mASS transit systems operate in the USA. samtrak1204: I understand that discrimination is a common complaint about rail planning, but LA is extremely spread out compared to New York City, so running subways with the same station density is simply impractical in LA, outside of perhaps the downtown core. Remember that LA’s rail system is designed as an interurban rail system. It inherited that from its predecessor, the Pacific Electric system, which covered over 1,100 miles of track (compared to 842 miles of track for the present NYC subway). If you want to compare apples to apples, the Los Angeles Railway “Yellow Car” streetcar network was the urban rail of Los Angeles, and in its day, it suffered from the same overcrowding and frequency of service issues that today’s bus riders complain about. LA’s best bet for improving its urban bus infrastructure is the construction of more bus lanes, the first of which is being installed along Wilshire for the 720 Rapid. However, we’re now extremely off-topic. Crayz9000: Thanks for straying off-topic. It’s good to “hear” a voice of reason. The State of Florida has different regulations than the State of California. I’m sure the State of Florida, Miami-Dade County and the City of Miami would easily build a Union Station right next to the airport. For one, I’m sure it’s a lot more easier to demolish and rebuild in Florida than California. That isn’t going to happen with LAX. The State of California, LA County, and the City of Los Angeles has so much bureaucratic redtape thanks to special interest groups that it takes forever to get anything done here. If LAX wanted to build a Union Station West, I like to see it happen too. But realistically, where is it going to be placed at? There’s too many businesses that are already occupied near LAX. Those have to bought out, demolished and rebuilt again. That alone is going to take decades of litigation and studies at a cost of billions of taxpayers dollars to get done. Furthermore, what both Metro and LAWA have been both silent about is how they intend to plan and build CONRAC as shown on the map when there is an existing neighborhood with businesses, a charter school, homes, and apartments in that area surrounded by Aviation, Century, La Cienega and Arbor Vitae. Anyone can see that on Google Maps. That’s going to be a huge budget nightmare right there. What’s LA going to do? Kick out apartment residents out into the street because they plan to build a CONRAC there? That’ll sure to be a big lawsuit if they try to do that. 1/ Why a second station on the light rail line less the .4 mile apart? What a waste of money. Expand Aviation/Century. 2/ APM does not loop LAX. It has to serve all terminals. Besides bring passengers from the light rail rails, the APM should also replace the terminal circulator busses. This would replace internal LAX busses as well as all the rental car buses. Other than this, I accept this as a solution, assuming the green line gets eventually extended from beyond LAX up to Santa Monica. I would have rather seen a north/south light rail under the run ways and serving more center or the CTA. Still can’t figure out how hard to tunnel under runways which are nothing more than large flat areas light a freeway.. Unless there are a lot pipelines or something. Having been through the Miami airport recently on a couple of occasions, what they are talking about building at LAX is pretty much a mirror of what is in Miami. Walking distances are about the same, the ride time on the people mover is about the same, and the rental car facility and connections to Miami Metrorail are about the same as the Crenshaw line connections. The only difference is Miami is moving their Tri-Rail (Metrolink equivalent) commuter rail station and Amtrak station to the integrated off airport facility because they were only a short distance away from the airport. That is not going to happen in LA as the airport is well away from the core heavy rail infrastructure at Union Station and trying to move that out to the westside wold make a mess of the network that has been in place for over a century. I would personally like to see a faster connection to downtown via rail than what is there, but the fly away bus does a better job of anything other than a direct connection. We have too many other demands for funds that can be put to better use than that sort of point to point system, unless…….. Monorail !!!!! Just kidding. Miami Metrorail is reasonably fast whereas LA light rail is slow as molasses . Is the station really going to be named ” 96th St/ Aviation station” ? Why not just name it “LAX Airport station” The Metro MTA RAPID TRAIN (slow light rail train in reality) should go directly into LAX International Airport Terminals 1-7 and Tom Bradley International!! Please build this system efficiently “That project is scheduled to be completed in 2019; the people mover could be completed as early as 2022 according to the Metro staff report and officials with Mayor Eric Garcetti’s office said Thursday that the city will attempt to possibly accelerate that date. ” Why does it take so long to build it by 2022? it should be completed much sooner say 3 years from now in 2017 not 2022 Its great that LA Metro is building trains but I wish that we had a RAPID TRANSPORT TRAIN link to LAX!! Eventually, the current Aviation/LAX station name should be scrapped in favor or naming the Aviation/96th as the new “LAX” station. Has Metro considered looking at this from a non-LA native travelers’ perspective? Let’s say I’m a tourist from China. Where should I go to get back to LAX? Oh yes, that’s right 96th/Aviation Stations makes perfect sense over a station that says LAX Airport. I was looking at that top map of the LAX area again & have this question: Why couldn’t LAWA extend its proposed people-mover to the Aviation/Century station? Is it something that LAWA, for whatever reason, is unwilling to do? I’m not from anywhere near the Los Angeles area (I’m from NYC), but just using common sense I think that the people-mover would benefit from extending the rail line to serve the Aviation/Century Station (thereby eliminating the need for Metro to build an infill station at Aviation/96th St.). 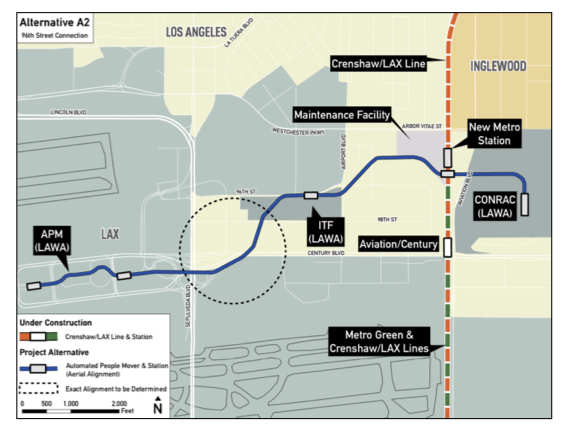 I don’t think it would cost as much money for LAWA to add another 1/2 mile or so for the people-mover to go to a station that’s now under construction; it may cost Metro a lot more cash to add an infill station just for the purpose of connecting to a rail line to LAX. I’ve said a few times that any rail connection to LAX is better than none at all, and I do think that Angelenos are legitimately closer to some sort of real rail service to LAX than ever. But I also believe that LAWA (and to a certain extend Metro as well) need to use common sense to deliver train service to LAX that doesn’t cost taxpayers unnecessarily.